I like to go into Fringe with an open mind, ready to fall madly in love with new artists I’ve never seen before. On the other hand, Fringe is long and busy and exhausting and sometimes a girl just needs something she can count on. A site-specific Michael Ross Albert play featuring Anne van Leeuwen as a high strung modern artist? The odds that this wouldn’t work for me were pretty low. The script is sharp, funny and incisive. Robert Motum’s direction strikes a smart balance between larger-than-life and emotionally grounded. The ensemble delivers across the board with good pacing and believable motivation (Lauren MacKinlay in particular does a lovely job with the play’s most understated character). 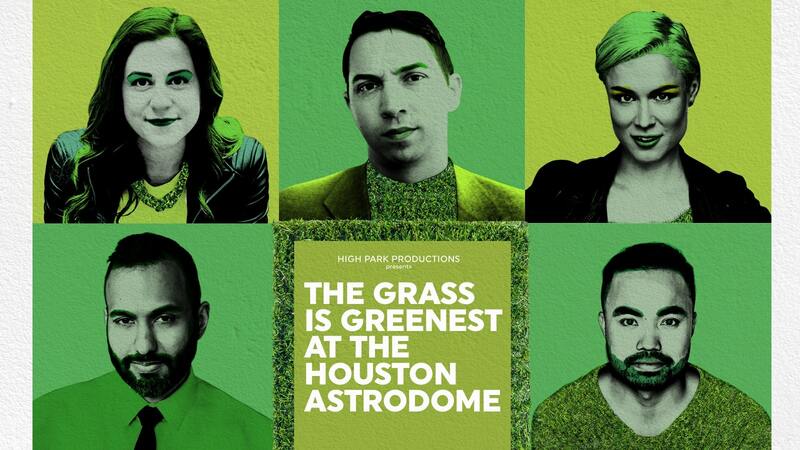 A couple line flubs were the only thing out of place at the performance I saw, making The Grass is Greenest one of only a handful of Fringe shows that already feels mainstage-ready. Written and directed by Danny Pagett, Prank is a fast-paced romp full of deep-seated personal hurt and dystopian warnings about the toxicity of our performative, validation-hungry culture. Christel Bartelse and Cydney Penner play sisters who were taken from their parents years ago after the adults’ quest for internet fame went a step too far. They’re very convincing as siblings, paired well visually with strong chemistry that insightfully reveals all the ways the women have purposefully diverged from each other while being permanently linked. I think it’s my favourite Pagett script thus far and his direction is quick and physical without failing to take necessary breaths. A really solid piece of work. Gillian Bartolucci’s energetic and big-hearted solo show about her energetic and big-hearted mother is well executed but messily structured. Bartolucci plays herself in elementary school waiting for her mother who is late to pick her up and uses this frame as a springboard to tell assorted stories about her mom’s eccentricities and philosophies. She’s a worthy protagonist and Bartolucci is a compelling performer but more consistency is needed to pull the emotion through the whole piece. A charming walking tour solo show that draws hilarious looks from passerby and very disruptive shouting from the West Neighbourhood House that the tour unfortunately stops just outside. Jamillah Ross is a strong improviser who interacts well with her audience and the outside world between scripted storytelling giving us glimpses into the hijinks and struggles of working as a Parking Enforcement Officer in downtown Toronto. Though the tour is pleasant and well-structured, both the comedy and tragedy of the perspective could use a boost. The scripted jokes need to be sharper but, more impactfully, the stories of harassment encountered by a female officer of colour should be allowed to really hit rather than be softened by the late-show appearance of a second character too cartoonish to be taken seriously. This play wherein two actors transition between a ton of different characters is technically very impressive (it has more lighting cues than most Fringe shows combined, the transitions are all smooth and well-choreographed) but absolutely totally confusing on a storytelling level. There isn’t much beyond small costume alterations and hair being pulled back or let loose to differentiate between characters so the flipping makes the story hard to follow and even harder to connect with. Is she his sister or his lover or his mother or his boss? All of them but you never really know which when. This deeply earnest drama about dealing with a loved one whose health is declining in old age is mostly hindered by an incredibly weak central performance. As an old man tired of his own decline, Bill MacDonald is compellingly natural and honest but the audience’s main conduit is his middle daughter Annie who is played by Andrea Davis with amateurish flourish and forced emotion. The other siblings all fare better though none are as polished as I’d like from a professional production. But the story is demanding, no easy feat to cast, especially with nine roles to unnecessarily fill. A tighter focus (and a total elimination of all bawdy jokes) would do the otherwise promising script wonders but, if you can look beyond Annie, there’s much to appreciate in Living Will as it is. One of my biggest Fringe pet peeves is the number of line flubs you hear throughout the festival. Almost everything feels at least a little bit underrehearsed and there’s always someone who can’t remember their lines. But at least most people try. Denise Norman walks around the stage carrying a binder with her self-written script, frequently losing her place and pausing to scan the pages so she can carry on telling her dully “edgy” alternative history of the Garden of Eden. By far the least professional show I’ve seen all Fringe.